Slingshot Dialer or Wizard -Flyer – Which is best? 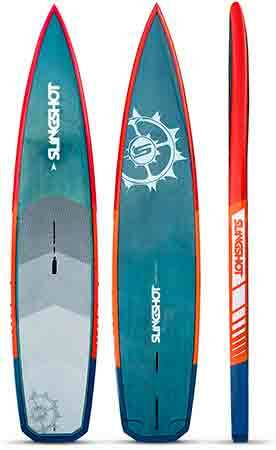 We often get asked what is the best Slingshot windfoil board for me? Here is the short answer. If you’re just starting to foil and are a bit timid the the Dialer board is a great choice. If you’re coming off an old board but have some foil experience and are feeling confident in your foiling prowess then look at the Wizard. Your board size choice should be based off your body weight. 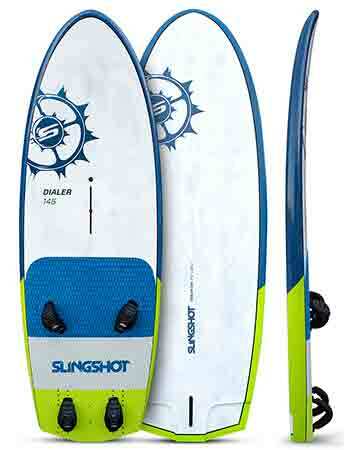 If your lake sailing and want to blow minds the Slingshot board for you is the Flyer. Check out the full details on each board listed below. The Dialer’s traditional shape and longer nose makes it best in class for learning to foil. The Dialer’s nose rebounds off the water when you touch down instead of nose diving. Nose-diving typically puts you over the handlebars. This rebounding action will help you gain confidence while you’re in the touch and go phase. Being confident in your windfoiling maneuvers will make the learning experience more fun, faster and shorter. Once you are foiling, the Dialer’s shape is helpful for balance and efficient for going upwind, downwind and at all points of sail. If the wind comes up, you can even sail it like a freeride slalom board. Sailors should select their board size based on body weight. Dialer 145 RIDER WEIGHT RECOMMENDATION: +77 kg – 170 lbs and up. 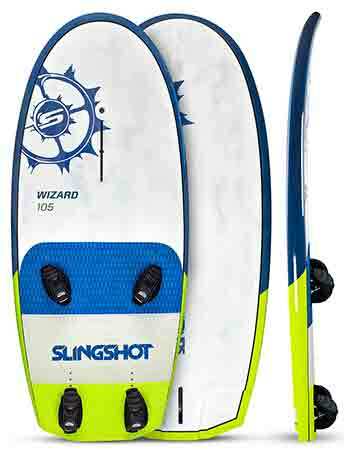 The main benefit of the Wizard board is the very low swing weight combined with good all-around usability. Once you get some time on a foil, you will recognize quickly that extra nose length translates to more swing weight which can impede the overall feel of your ride. This board also offers easy up-hauling, which is an important attribute. You can decide on your board size based on volume metric alone. The FLYER is a double agent. You can paddle it or foil it. Pair it with the Hoverglide FWIND1 Foil and commune with nature in the lightest of winds. The days of “not enough wind to have fun” are over. No wind, spotty wind, light wind, no problem! Optimize poor conditions at your local lake. The hull shape on this board is designed for sub-planing conditions. Even a puff of wind gets the Flyer up on foil. Foil around all day with the confidence that you will get back exactly where you started. Start enjoying the simplicity of low wind, lake cruising. Fly across the water silently, then drop back to cruising. The feeling is surreal and so are the possibilities. Sign up for Foil-Academy today. It’s free. Or call us anytime. 509 427 4950. We’ve got experts from the leaders in foilboarding standing by to answer questions.